To build your best-in-class movie streaming platform for stunning viewer experience. Design, distribute, monetize and market with detailed customizations and all-in-one technicised features. Build streaming apps with formidable responsive pages, zero loading time and magnificent operational efficiency. Equipped with adaptive bitrate, Vplayed’s video player, puts an end to buffer no matter what the end user’s bandwidth is. Integrate any payment gateway of your choice to your app at ease, from online payment systems to barcode transactions. Power up media streaming by featuring unlimited content on your application without any hassles. Convene unending high definition streaming choices on any device and on any platform with low latency. Accelerate the performance of your mobile, web apps with HLS player, a thoroughly customisable, efficient video player that enables HD streaming in an instant. Content storage at your own premises or on cloud of your choice! Whatever may be your choice, Vplayed ensures highly scalable delivery. Fortify your data files intact through DRM, access control, encryption, watermarking, password protection and single sign-in security pursuits. All the marketing properties a movie streaming platform can need. And more. Deliver noiseless content with pristine quality. Optimised in terms of SEO and meta data, solutions built by Vplayed has consistently shown high success rates. Ladle out to your viewer base with a video portal of impeccable scalability. 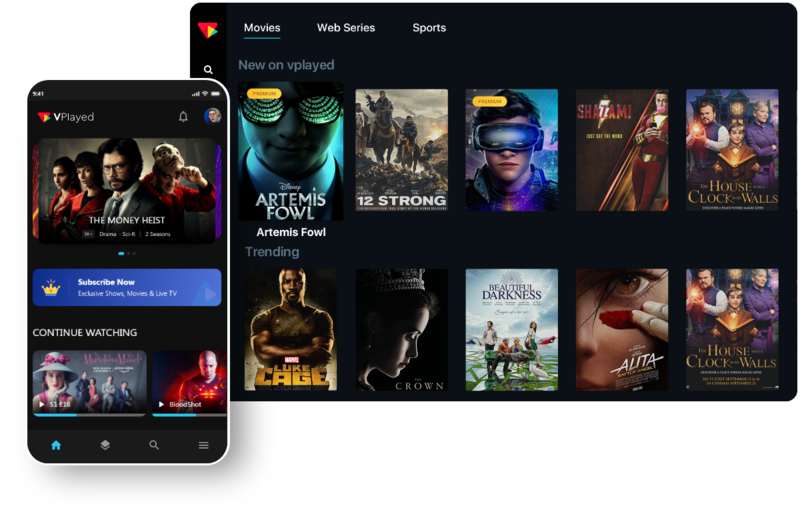 Vplayed’s movie streaming software is suited with a colossal CDN to stream and store unlimited data. Make streaming a fun and interactive activity with social publishing feature that allows commenting, sharing and favoriting on videos. Vplayed’s search engine displays results calculated with auto suggest loaded with names, genres and other relatable terms. Preroll, Midroll or Postroll - Ad based monetization integration strategically placed according to the performance of videos churns out the maximum revenue. Coupons and promotions placed with an eye for successful response rates, and relevant to customers bags astounding revenue.